The planet HD80606b glows orange from its own heat in this computer-generated image. A massive storm has formed in response to the pulse of heat delivered during the planet's close swing past its star. The blue crescent is reflected light from the star. Image by D. Kasen, J. Langton, and G. Laughlin (UCSC). To see a movie of the thermal storms evolving in the planet's atmosphere, click here. Astronomers have observed the intense heating of a distant planet as it swung close to its parent star, providing important clues to the atmospheric properties of the planet. The observations enabled astronomers at the University of California, Santa Cruz, to generate realistic images of the planet by feeding the data into computer simulations of the planet's atmosphere. "We can't get a direct image of the planet, but we can deduce what it would look like if you were there. The ability to go beyond an artist's interpretation and do realistic simulations of what you would actually see is very exciting," said Gregory Laughlin, professor of astronomy and astrophysics at UCSC. Laughlin is lead author of a new report on the findings published this week in Nature. The researchers used NASA's Spitzer Space Telescope to obtain infrared measurements of the heat emanating from the planet as it whipped behind and close to its star. In just six hours, the planet's temperature rose from 800 to 1,500 Kelvin (980 to 2,240 degrees Fahrenheit). Known as HD 80606b, the planet circles a star 200 light years from Earth, is four times the mass of Jupiter, and has the most eccentric orbit of any known planet. It spends most of its 111.4-day orbit at distances that would place it between Venus and Earth in our own solar system, while the closest part of its orbit brings it within 0.03 astronomical units of its star (one astronomical unit is the distance between Earth and the Sun). The planet zips through this dramatic close encounter with its star in less than a day. At the closest point, the sunlight beating down on the planet is 825 times stronger than the irradiation it receives at its farthest point from the star. "If you could float above the clouds of this planet, you'd see its sun growing larger and larger at faster and faster rates, increasing in brightness by almost a factor of 1,000," Laughlin said. Spitzer observed the planet for 30 hours before, during, and just after its closest approach to the star. The planet passed behind the star (an event called a secondary eclipse) just before the moment of its closest approach. This was a lucky break for Laughlin and his colleagues, who had not known that would happen when they planned the observation. The secondary eclipse allowed them to get accurate measurements from just the star and thereby determine exact temperatures for the planet. The extreme temperature swing observed by Spitzer indicates that the intense irradiation from the star is absorbed in a layer of the planet's upper atmosphere that absorbs and loses heat rapidly, Laughlin said. Coauthor Jonathan Langton, a postdoctoral researcher at UCSC, fed the Spitzer data into a hydrodynamic model of the planet's atmosphere to predict its response to the intense heating. Langton's simulation shows the global storms and shockwaves unleashed in the planet's atmosphere every 111 days as it swings close to its star. "The initial response could be described as an explosion on the side facing the star," Langton said. "As the atmosphere heats up and expands, it produces very high winds, on the order of 5 kilometers per second, flowing away from the day side toward the night side. The rotation of the planet causes these winds to curl up into large-scale storm systems that gradually die down as the planet cools over the course of its orbit." 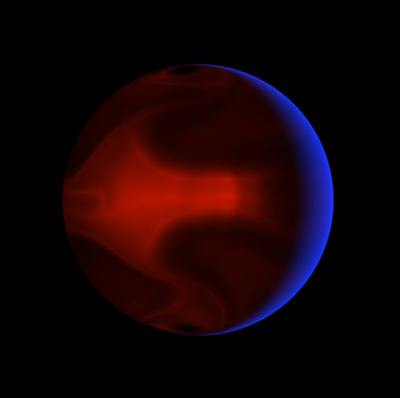 Daniel Kasen, a Hubble postdoctoral fellow at UCSC, was able to generate photorealistic images of the planet using a program he developed to calculate radiative transfer processes in astrophysics. "It calculates the color and intensity of light coming from the glowing planet, and also how starlight would reflect off the surface of the planet," Kasen said. The resulting images show a thin blue crescent of reflected starlight framing the night side of the planet, which glows cherry red from its own heat, like coals in a fire. "These images are far more realistic than anything that's been done before for extrasolar planets," Laughlin said. If the planet's orbit is aligned just right, it will pass in front of the star (an event known as a primary transit) on February 14. Both professional and amateur astronomers worldwide will be watching to see if this happens. The occurrence of primary transits would enable astronomers to learn more about this unusual planet by conducting spectroscopic observations. HD 80606b was originally discovered in 2001 by a Swiss planet-hunting team led by Dominique Naef of the Geneva Observatory, Switzerland. Using a method known as the Doppler-velocity technique, they detected the tell-tale wobble in the light from the star caused by the gravitational tug of the planet. Subsequent observations by Laughlin's colleagues on the California & Carnegie Planet Search team--Steve Vogt at UCSC and Paul Butler at the Carnegie Institute of Washington--provided precise information about the planet's orbit, which was essential for planning the Spitzer observations. Drake Deming of NASA's Goddard Space Flight Center contributed his expertise to the analysis of the Spitzer data. Other coauthors of the Nature paper include UCSC postdoctoral researcher Eugenio Rivera and graduate student Stefano Meschiari. The Spitzer Space Telescope is operated by the Jet Propulsion Laboratory (JPL), California Institute of Technology (Caltech), under contract to NASA. Support for this work was provided by NASA through an award issued by JPL/Caltech. Note to reporters: You may contact Laughlin at (831) 419-3726 or laughlin@ucolick.org.